Received his Masters Degree in music performance from the University of Wisconsin – Madison and performs on trumpet (B flat, C, piccolo, high E flat, low F alto), flugelhorn, cornet, bugle, and sings, as well. As a first call full time recording studio musician, Bobby logged over 7500 recording sessions (TV and radio commercials, records, and films). He toured and recorded with Jack Teagarden, Tex Beneke and the Modernaires; has been conductor, music director, and featured soloist with Peggy Lee; and over the years has made numerous appearances with Tony Bennett and many other artists. He also has performed with the Chicago Symphony Orchestra, the orchestras of Saint Louis, and Milwaukee . Producer (Executive and Musical) of 11 CD recordings of creative musical interpretations ofstandards, latin tunes, and melodic originals by Bobby and his band members . Under the guidance of Dr. Renold Schilke, Bobby created THE FOREFRONT, a contemporary ensemble of four trumpets, bass and drums that performed at the 1972 Trumpet Symposium in Denver and the First International Brass Conferennce in Montreaux, Switzerland in 1976. He received two music composition fellowship grants from the National Endowment for the Arts to write for the group. BOBBY LEWIS – IN THE FOREFRONT, a re-issue on CD, includes music from LP recordings (1973 -75) Incantation and In The Forefront. 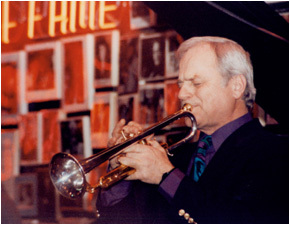 Bobby has performed at jazz festivals, concerts and brass conferences in India, Japan, Australia, The Netherlands, Scotland, Switzerland, Germany, Poland, Canada and the United States. He exclusively plays the Schilke X4L and X3L tunable bell Bflat trumpets and the P5-4 piccolo trumpet which he purchased from Schilke Music Products.